Aussie debutant Marcus Harris has secured his first half-century in the baggy green in front of a Perth home crowd as the batting woes that plagued Justin Langer's men in Adelaide look a distant memory. The 26-year-old batted clinically throughout the morning as India struggled to ask questions of the local boy and fellow opener Aaron Finch at the crease, who silenced his critics with a gritty 50 before falling to Jasprit Bumrah. Harris impressed with calculated stroke-play on a wicket that was widely expected to be play to the bowlers, as he went on to smack nine fours on his way to 50-runs. The pair's unbeaten 105-run stand is Australia's highest partnership of the series, after the top-order capitulated in the first Test at Adelaide Oval. Australian cricket legend Adam Gilchrist praised Harris' composure at the crease urging him to lead the charge in a blossoming first inning's with Usman Khawaja joining at the bat. "He's showing maturity beyond his years here," Gilchrist told Fox Sports. Harris stumbled twice in Adelaide as he was settling in at the crease. Mark Taylor believed his 52-run total across both innings proved enough to dispel the nerves in the baggy green ahead of his hometown return. “The nerves will be partly gone now. He’s got a couple of 20s under his belt, he’ll feel disappointed he didn’t make a score but relieved that he didn’t disgrace himself,” Taylor said. Meanwhile Finch's half-century will do wonders to silence the growing sense of unease with his opening capabilities. However, the big-hitter's innings wasn't without its fair share of scares. He survived two confident lbw shouts off consecutive balls when he was on 20. 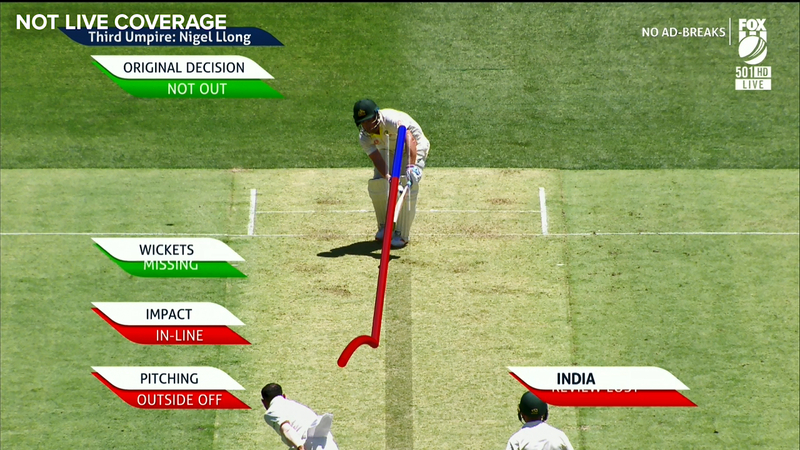 India reviewed the first, with ball-tracking vision showing Mohammed Shami's delivery would have gone over the stumps. Finch's second lbw appeal was even closer - with ball-tracking vision declaring it would have been the umpire's call.